I LOVE XCOM the video game. I remember playing its first version and loving the tactical placement of my squad as well as the management of the base so as to advance my technologies and ensure my soldiers are better equipped to eliminate the aliens that the game throws at us. The latest version of XCOM provides not only enhanced graphics but the tactical battle can be seen like a miniatures game of sorts as you control your soldiers and decide how many steps to move and what actions to take, based on an action point system. The game definitely have many elements that can carry over well onto a tabletop format. 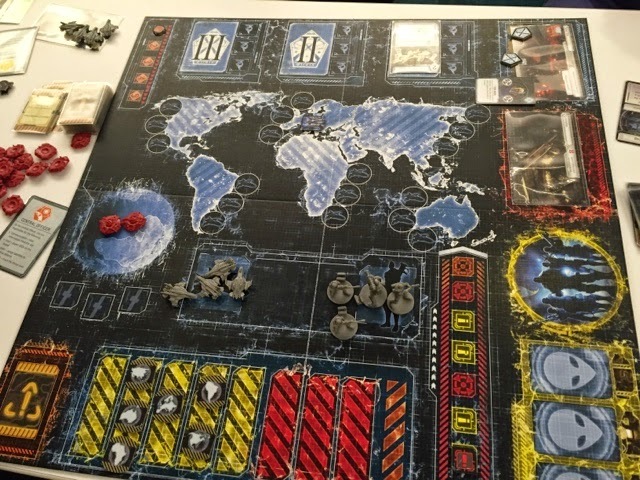 To that end, Fantasy Flight Game released X-COM the boardgame in 2014 but it really saw the market in a big way in 2015. So how is the game and had Fantasy Flight Games done a good job ? One of the better dice rolls we can have. Not by me though..
Well to summarize, Yes and No. 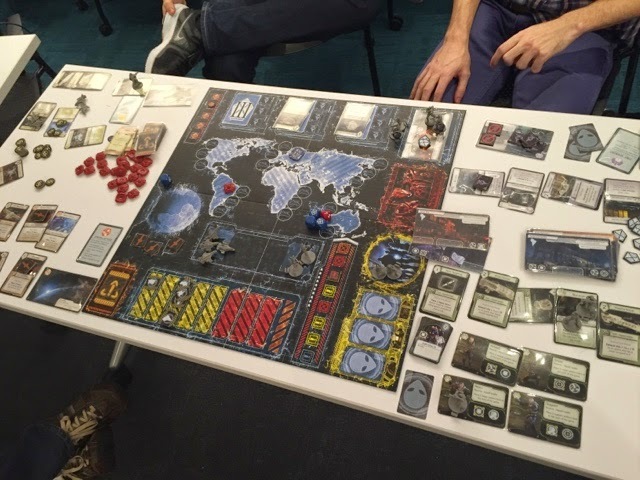 In FFG's XCOM, 1-4 players will play 4 different roles that range from managing the budget to allocation of soldiers to missions, protecting bases as well as determining what technologies to research and where to send the interceptors. Depending on the difficulty selected, a particular final mission will be chosen and players are expected to complete at least 2 missions before attempting and completing the final mission. All this time, players are expected to keep 2 continents out of the PANIC region as well as preventing their base from getting destroyed. The key gimmick in this game is that there's a companion application that you need to use otherwise the game will not function. The application dictates which player's action needs to be executed as well as inform players when aliens are appearing or attacking. It also helps to take care of logistical calculations for example how much budget the team has at the beginning of each round. In addition, the music helps create the ambience for the game. 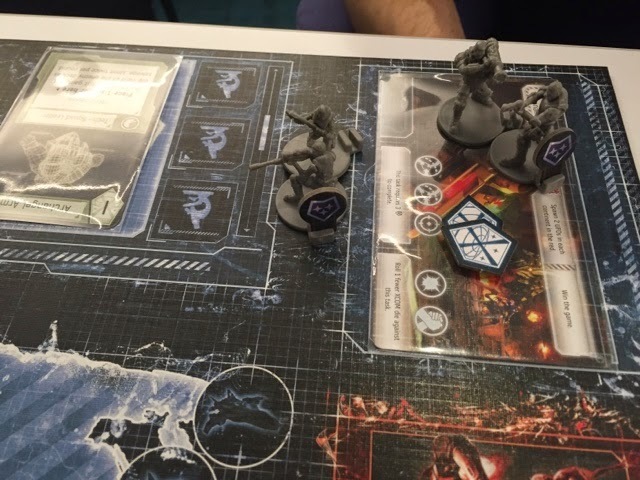 So Yes, FFG's XCOM does bring to players the tense and interesting elements of the video game. The theme of the game comes across wonderfully with the great components and excellent art in the game. The scientist has to decide what technology to research and how many scientists to assign to each project and having good technology will be crucial to completing missions and ultimately win the game. The commander ensures everyone knows how much budget is available as well as control the interceptors to wipe out the UFOs that have landed on the continents. The communication officer not only controls the application (i.e. informs the team what actions are to be executed now) but also work with the commander to ensure that the amount of UFOs that are on the board is manageable. Lastly, the Squad Leader decides what soldiers to send to defend the base, complete missions and ultimately, accomplish the objectives of the final mission to win the game. Throughout the game, the team will have to communicate to ensure that they do not go over budget or leave UFOs unattended in the orbit or on Earth as these will cause panic to rise. Thus in many aspects, the theme of the game shines through via the game mechanisms and each role plays very different from each other. The timed phase, where players will make decisions, seed aliens and UFOs, is a very tense and interactive part of the game. Players are checking what they can do (in the form of asset cards) as well as communicating to each other and in some tense moments, yelling to ensure the action is done within the time limit. Its exciting and a lot of planning and communication is involved. This phase is very fun and exciting. The only flaw that I can see in this phase is the amount of cards to manage. To win the game, you require a lot of technology and knowing what all the cards you have can do is very important if you want to win the game. This can get a little bit overwhelming as you can see in my last picture just how many cards we eventually have to win our game. However, the next phase is where it became a huge letdown for me. The resolution phase is where the team now goes through each section of the board and sees if they succeed in the tasks. This is done by...... ROLLING DICE. For each task, you will get to roll a blue die for each XCOM resource that you have assigned to it. Along with that, you will roll the red alien die. The blue dice have only 2 success faces (thus 33.3333% success rate) but you get to add a success token for each success rolled. The Alien die you will need to roll above the threat level. Otherwise there will be a loss and losses are either exhausting a scientist or satellite (knocking it out for 1 round) or worse, destroying an interceptor or killing a soldier. The threat level increases each time you decide to push your luck and try for the task again. For the Squad leader however, the threat level does not decrease between tasks, thus making this role much more dependent on dice roll. Here in lies the biggest problem I have with the game. The randomness of the dice roll and the cards seems to break the flow that we have in the timed phase of the game. There was so much planning, even though it maybe hectic, and strategizing that for the resolution to boil down to rolling dice is such a big let down for me. If you are really unlucky for example, you may draw crappy tech cards and then, even though you may have assigned 3 scientists (max) to that technology, you may not even succeed! Every loss exhausts a scientist which means you get to roll 1 less die thus you could, through very bad luck, end up with nothing helpful for subsequent rounds. The technologies are the cards that will help in some way to mitigate this randomness but if right at the start you have extremely bad luck, then these technologies cannot be realized to even help you. You also need to be able to draw the right cards near the start of the game to ensure that you don't get overwhelmed easily. The narrative it creates and the tense moments it provides is exciting and even fun, the overall feeling when it comes to the resolution part really pulls the game down for me. Granted that this is an Ameritrash game and I should have known better etc etc but I had a lot of high hopes for this game since there is a lot of hype and quite a few reviewers I know are raving about it but the euro-gamer in me is quite put off by the large amount of randomness in the game. So even if you have planned really well and managed everything the best that you possibly can, a series of bad dice roll can really screw up your plans and makes it feel as if all that planning doesn't really matter! In our last game, which we won by the way, everyone else had amazing dice rolls and we were not worried about UFOs and panic in our continents but the squad leader, me, was failing on the dice roll. We were stuck on 1 mission for 2 rounds and our base was steadily getting damaged. We had a round where I lost 8 soldiers and had to spend the next round recruiting them back. Chatting with my classmates who played the game, they all felt that the timed phase is very interesting and has a lot of potential. But they agreed that the randomness is quite a put off. Someone even commented after we rolled that this shows just how random the game is. 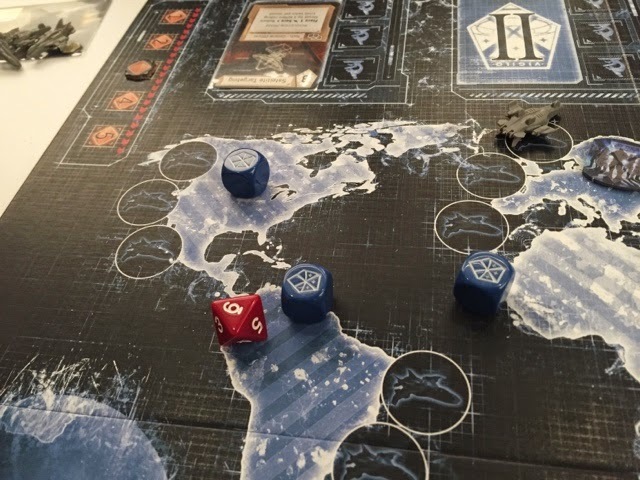 Even though we had the right technology that allowed re-rolling of the alien die and also allocate success, bad dice rolls means we could not complete the missions because the threat level became too high. Thus in summary, even though this might be controversial, I will have to say that this is a Try before you Buy. It has a lot of potential and does capture the elements of the video game well, but it just did not sit well with me. I will be putting it on my For Trade list unfortunately.